Parkinson’s disease affects nearly 10 million people worldwide and 4 million of them suffer from snoring and sleep apnea. Parkinson’s is a chronic neurodegenerative disease that attacks neurons located in the brain. The neurons release a chemical called dopamine which causes the brain to lose control of body movement and function. The more dopamine is released, the more spastic the body movements become and cannot be controlled. One of the most recognizable symptoms of Parkinson’s is tremors. They occur in the hands, arms, legs, and even in the face. They are uncontrollable by the patient and can become very burdensome and frustrating for the individual as the disease becomes more chronic. Some patients are not aware of the tremors in the early stages of Parkinson’s. The same is true for the later stages when they lose all feeling and control during the tremor movements. Stiffness in the body can also occur. Stiffness in the muscles is referred to as rigidity. The muscles tighten and are not as flexible as they once were. The stiffness may look like partial paralysis in certain limbs including the legs, arms, feet, and neck. Another symptom of Parkinson’s is slowness or impaired movement in the body and actions – commonly referred to as Bradykinesia. Spontaneous and quick movements or impulses are typically eliminated or are seen on rare occasions. 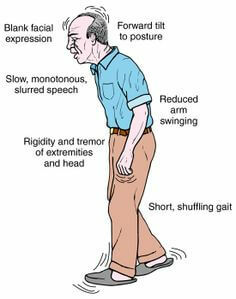 Losing your balance is also a common symptom of Parkinson’s. Typically many of these symptoms are occurring at the same time and it may be difficult to walk and keep your balance when you have leg and arm tremors happening alongside the tightening of your muscles. Many patients use a wheelchair as their symptoms worsen over time. Restless leg syndrome is usually a side effect that occurs at night. Nighttime can be extremely difficult for those with Parkinson’s since medicine keeps them and their partner awake. Restless legs can interrupt sleep and also prevent one from falling asleep. Snoring is a side effect of sleep apnea, and apnea is present in at least forty percent of Parkinson’s patients. Some antidepressants trigger sleep apnea which may be prescribed to patients. Other airflow obstructions can also occur which limits the amount of oxygen to the brain, which is already stressed from the disease. There currently is not a cure for this disease, however, it can be treated with a range of medicines and surgeries in order to manage the side effects as best as possible. One of the many side effects of Parkinson’s is interrupted sleep and nighttime disturbances. Due to the tremors and limb stiffness, it is often difficult for those with Parkinson’s to fall asleep. These interruptions can also wake you up if you are in the middle of a deep sleep. Discomfort due to limb rigidity and tremor movements do not help the situation either. Some medicines can also interrupt sleep and some patients end up getting their days and nights mixed up with certain prescription medicines. According to the Parkinson’s Disease Foundation, over 40% of Parkinson’s Disease patients suffer from sleep apnea. Many people w ith Parkinson’s are loud snorers as well, a symptom of sleep apnea. Sleep apnea and snoring occur when there is an obstruction in the airway. When air has to find another route around an obstruction, it passes down the throat near the sides of the pharynx next to the fatty mouth tissues. These tissues start to vibrate as the air hits them and the vibration creates the loud sound of snoring. Sleep apnea comes into play when your body actually pauses breathing or snoring, and the oxygen flowing into your body and brain become interrupted. When this happens, you literally stop breathing. When your body senses this stop, a signal from the brain is sent and you wake up (sometimes unknowingly) and start breathing again, usually with a deep gasp for air or extremely loud snore. 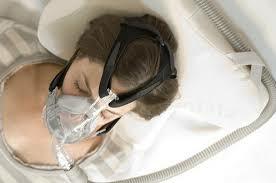 This type of sleep apnea is called obstructive sleep apnea or OSA. Another type of sleep apnea is known as central sleep apnea. Central sleep apnea (CSA) is also linked to Parkinson’s disease because unlike an obstruction in the airway in OSA, CSA results in a miscommunication from the brain. The brain fails to signal the muscles in your respiratory system to breath, thus skipping a breath or multiple breaths. This is more common in Parkinson’s patients since neurons in the brain are already malfunctioning and producing dopamine. Scientists relate to sleep apnea with Parkinson’s due to these brain malfunctions, which is why the presence of sleep apnea is so common in the disease. There are several types of treatments and therapies out there specifically to treat snoring and sleep apnea. Let’s look at a few options below. The main treatment for sleep apnea not only for Parkinson’s patients but for the vast majority of sleep apnea sufferers is the use of a CPAP machine. CPAP stands for continuous positive airway pressure and it is a therapy for treating obstructive sleep apnea. The CPAP machine is a small lunchbox-sized machine that sits on your nightstand or next to your bed with a series of tubes connected to a face mask. The person wears the face mask which is attached to a tube where oxygen is being pumped by the machine and into your nose. The oxygen is pumped by a steady flow consistently throughout the night so that there is no breathing pattern interruption. Work with your doctor to determine which type of sleep apnea you are experiencing. Your doctor will administer a sleep study to better understand your sleeping patterns and the extent of the apnea. There are several snoring treatments available on the market. Over the counter, products include nasal cones, nasal strips, nasal sprays, essential oils, and night guards. Prescription based products including snoring mouthpieces and tongue stabilizing devices can also be quite effective. Surgical procedures like the pillar procedure and a tonsillectomy are also other more invasive options. It’s important to consult your doctor when deciding on the best snoring solution for you or a loved one with Parkinson’s disease. Previous post: Nasal Cone vs Mouthguard – Which One is Better For Snoring?